Farmabrasilis is a non-governmental, non-profit research network bringing together Brazilian, American and European scientists and people devoted to the research and development of new medicines and technologies for the benefit of economically disadvantaged populations and individuals affected by neglected diseases. Since 1987, Farmabrasilis has been developing innovative and efficient medicaments for cancer and infectious diseases. Farmabrasilis operates under very modern organizational concepts. In recent years, proposals were put forward of new models for institutions that develop medicines. In the open source model, licenses may be granted to third parties to produce molecules free from royalties. A virtual research network model has been implemented by such non-governmental organizations as OneWorldHealth and TB Alliance. In such a model, an organization acts as a coordinating instance, leading the efforts of member individuals, universities and other institutions which possess research capabilities and facilities. Farmabrasilis uses both models above. It has been leading a virtual research network for the last 17 years, and exercises an open source policy whenever needed. Its medicaments can be licensed without royalties when necessary in order to extend their use to populations that would otherwise be unable to purchase them. Results achieved with this organizational model have shown that it is possible to develop, test and produce new pharmaceuticals without incurring the high costs usual in the industry, which often raise the price for the consumer and put the medicaments out of the reach of wide segments of the world population. These results indicate that the model for creation and distribution of pharmaceuticals practiced by Farmabrasilis is a scientifically, economically and socially feasible proposal. 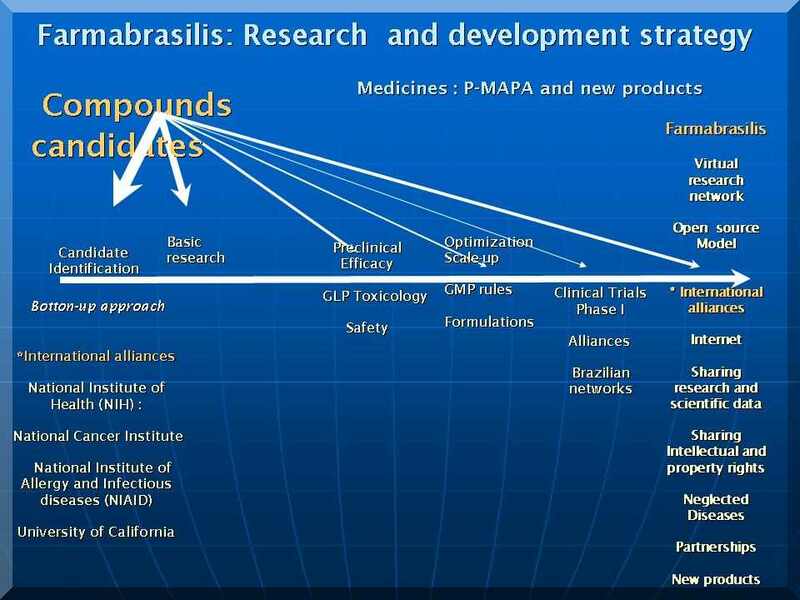 Farmabrasilis participates in this global movement for research and development of medicaments, and invites interested institutions, individuals and groups to join efforts and set up production and distribution partnerships for our pharmaceuticals, and establish alliances to expand the access of socially excluded populations to new medicines. Join this global endeavour for the research and production of new medicines !